1Section of Gastroenterology, Department of Medicine, Southern Arizona VA Health Care System, Tucson, Arizona, USA. 2Mayo College of Medicine, Mayo Clinic, Jacksonville, Florida, USA. Received: February 11, 2011; Revised: March 17, 2011; Accepted: March 28, 2011; Published online: April 27, 2011. Noncardiac chest pain is defined as recurrent chest pain that is indistinguishable from ischemic heart pain after a reasonable workup has excluded a cardiac cause. We did not include frequency or severity of chest pain in our definition, because there is no clear spectrum or threshold of both clinical parameters in the literature. As a result, any attempt to limit the frequency and/or severity of chest pain may exclude many true sufferers with NCCP. There are many causes for NCCP, and they are not limited to the esophagus (Table 1). Thus, the term NCCP is more inclusive and includes musculoskeletal, pulmonary, cardiovascular, infectious, drug-related, psychological and other GI disorders.14 Our focus in these guidelines will be only on esophageal-related mechanisms for NCCP. The Rome Criteria do not specifically address NCCP but rather a subset of patients with NCCP termed FCP of presumed esophageal origin.9 These are patients with recurrent episodes of substernal chest pain of visceral quality with no apparent explanation using currently available tests. Noncardiac chest pain is a prevalent disorder resulting in high healthcare resource utilization and significant work absenteeism. A study by Eslick and Talley28 reported that 78% of patients who presented to a hospital emergency department with acute chest pain had seen a healthcare provider in the last 12 months. The most common healthcare provider seen was a general practitioner (85%), followed by cardiologist (74%), gastroenterologist (30%), pulmonologist (14%), alternative therapist (8%) and psychologist (10%).28 A multiple logistic regression analysis revealed that patients with chest pain who are also suffering from heartburn were 16 times more likely to see a general practitioner (OR, 16.40; 95% CI, 1.98-135.99) and 3 times more likely to consult a gastroenterologist (OR, 3.10; 95% CI, 1.26-7.62). Additionally, work absenteeism rates (29%) and interruptions to daily activities (63%) were high because of NCCP. Many patients with NCCP report poor quality of life and admit taking cardiac medications despite lack of evidence for a cardiac cause. Only a small fraction of patients feel reassured. Consequently, the economic burden of the disease has been proposed to be very high, although studies evaluating the cost impact of NCCP on the healthcare system are very scarce. In 1 study, the healthcare cost for NCCP was estimated to be more than $315 million annually, primarily because of multiple clinic visits, emergency room visits, hospitalizations and prescription medications.29 This cost estimate does not include indirect costs such as lost days of work or the impact of symptoms on patients' quality of life, which have been demonstrated to be more significant when evaluating the economic burden of patients with functional bowel disorders. In Australia, the annual cost associated with NCCP presentations to the Nepean Hospital amount to approximately a $1.4 million.30 The researchers extrapolated these costs to the Australian healthcare system and conservatively estimated that NCCP accounts for at least a $30 million of the healthcare budget annually. Noncardiac chest pain is a chronic disorder that reduces patient's quality of life but has no impact on mortality. In a recent study that followed 355 NCCP patients, the authors demonstrated that 49% sought care in the emergency department, 42% underwent repeated cardiac workup, and only 15% were seen by a gastroenterologist.13 Survival free of cardiac death in the subset with NCCP and a GI disorder was 90.2% at 10 years and 84.8% at 20 years, compared to 93.7% at 10 years and 88.1% at 20 years for those with NCCP of unknown origin. Less than a handful of studies reported similar mortality between patients with NCCP and those with CAD.37,40 A more recent study by Eslick and Talley41 followed 126 NCCP and 71 cardiac patients who were seen in the emergency room for a period of 4-year. The majority of the NCCP (71%) and the CAD patients (81%) continued to have symptoms 4 years later. The authors found no difference in the mortality rate between the 2 groups (CAD-11.0% vs NCCP-5.5%, P = 0.16). However, the study may suffer from type II error, and the results need to be confirmed in a larger cohort of patients. Overall, the aforementioned data support the overall conclusion that increased mortality is uncommon in NCCP patients. However, patients with NCCP demonstrate poor quality of life primarily due to continuation of symptoms many years after diagnosis. Gastroesophageal reflux disease is the most common esophageal cause for noncardiac chest pain in patients with and without coronary artery disease. Many studies have shown an association between GERD and NCCP. However, association does not confer causality. Resolution or improvement of chest pain symptoms in response to treatment with antireflux medications provides the missing causal link. The presence of esophageal mucosal abnormalities consistent with GERD appears to be less common in NCCP patients than GERD symptoms or excess esophageal acid exposure. From different studies, the range has been between 2.5%-75%.14,49,51,52 In 3 different studies evaluating the role of the PPI test in patients with NCCP, the authors found GERD-related endoscopic findings in 44%-75% of the NCCP patients.43-45 In all of these studies, low-grade erosive esophagitis was the main GERD-related endoscopic finding. A recent study by Dickman et al53 evaluated upper GI findings in patients with NCCP as compared with those having only GERD-related symptoms using a large multicenter consortium. Of the NCCP group, 28.6% had hiatal hernia, 19.6% erosive esophagitis, 4.4% Barrett's esophagus, and 3.6% esophageal stricture/stenosis (Table 2). The prevalence of these findings was significantly lower in the NCCP group when compared with the GERD group. From this study, it appears that GERD-related mucosal abnormalities are not uncommon in the esophagus of NCCP patients. However, the prevalence of these anatomical findings is lower than what has been observed in GERD patients. Importantly, NCCP patients may also demonstrate Barrett's esophagus, albeit uncommonly. The mechanism by which gastroesophageal reflux causes NCCP remains poorly understood. It is still unclear why esophageal exposure to gastric content in some patients causes heartburn and in others chest pain. This is compounded by the fact that some patients may experience chest pain at 1 time and heartburn at other times. Characteristics of the individual reflux episodes (duration and pH level) have been proposed to influence patients' symptoms. Smith et al54 studied 25 individuals with NCCP to determine the relation between the sensation of pain in GERD and pH of the refluxate. They found that all 25 patients had reproduction of their pain during intraesophageal infusion of solutions with pH 1 and 1.5. Reflux events resulting in pain were significantly longer than those without pain and were more often associated with a recently preceding painful episode. Different underlying mechanisms have been suggested to result in esophageal hypersensitivity in NCCP patients. These include peripheral sensitization of esophageal sensory afferents leading to heightened responses to physiologic and pathologic stimuli and modulation of afferent neural function at the level of the spinal dorsal root or the central nervous system.55 In 1 study,56 healthy subjects underwent perfusion of the distal esophagus with normal saline or 0.1 N hydrochloric acid. Perceptual responses to intraluminal esophageal balloon distension were evaluated using electronic barostat. As compared with saline, acid perfusion reduced the perception threshold (innocuous sensation) and tended to reduce the pain threshold (aversive sensation). This study demonstrated short-term sensitization of mechanosensitive afferent pathways by transient exposure to acid. The authors suggested that in patients with NCCP, acid reflux induces sensitization of the esophagus, which may subsequently alter the way the esophagus perceives otherwise normal esophageal distentions. Sarkar et al57 recruited 19 healthy volunteers and 7 patients with NCCP. Hydrochloric acid was infused into the distal esophagus over 30 minutes. Sensory responses to electrical stimulation were monitored within the acid-exposed distal esophagus and the non-exposed proximal esophagus before and after infusion. In the healthy subjects, acid infusion into the distal esophagus lowered the pain threshold in the upper esophagus. Patients with NCCP already had a lower resting esophageal pain threshold than healthy subjects. After acid perfusion, their pain threshold in the proximal esophagus fell further and for a longer duration than was the case for the healthy subjects. Additionally, there was a decrease in pain threshold after acid infusion in the anterior chest wall. This study demonstrated the development of secondary allodynia (visceral hypersensitivity to innocuous stimulus in normal tissue that is in proximity to the site of tissue injury) in the proximal esophagus by repeated acid exposure of the distal esophagus. The concurrent visceral and somatic pain hypersensitivity is most likely caused by central sensitization (an increase in excitability of spinal cord neurons induced by activation of nociceptive C-fibers in the area of tissue injury). The patients with NCCP demonstrated visceral hypersensitivity and amplified secondary allodynia in the esophagus. Studies have demonstrated that NCCP patients with evidence of GERD (endoscopic findings and/or abnormal pH test) commonly respond to antireflux treatment. Between 78%-92% of NCCP patients with objective evidence of GERD demonstrated symptoms improvement on antireflux treatment.43,45,48,49 In contrast, response to PPI treatment in NCCP patients without objective evidence of GERD ranged between 10% and 14%.43-45 It Kushnir et al61 have demonstrated that a positive symptom-association probability and elevated acid exposure time predicted response to PPI treatment in patients with NCCP. When used hierarchically, response to antireflux treatment was best predicted when GERD parameters (acid exposure time, symptom-association probability and symptom index) were all abnormal and poorest when all normal. These data suggest a causal relationship between patients' GERD and chest pain symptoms. Only the minority of patients with noncardiac chest pain demonstrate esophageal motility abnormalities. Several large studies demonstrated that approximately 30% of NCCP patients had abnormal esophageal manometry.62-64 In 1 study that included 910 NCCP patients, the authors found that 70% had normal esophageal motility.62 Nutcracker esophagus (14.4%) was the most commonly documented esophageal motility abnormality, followed by nonspecific esophageal motor disorder (10.8%). Diffuse esophageal spasm, achalasia and hypertensive lower esophageal sphincter were very uncommon in this NCCP group. In another study, Dekel et al63 evaluated 140 NCCP patients using the Clinical Outcomes Research Initiative database. Unlike the previous study that included patients from 1 major center with interest in esophageal motility, the study by Dekel et al63 included patients from more than 60 academic, Veteran Affairs, and private centers from around the United States. The authors also found that 70% of the subjects had a normal esophageal motility test. Hypotensive lower esophageal sphincter (61%) was the most common motility abnormality diagnosed, followed by hypertensive lower esophageal sphincter, nonspecific esophageal motor disorder and nutcracker esophagus (10% each). In this study, achalasia and diffuse esophageal spasm were also very uncommon. The difference in the distribution of motility abnormalities between the 2 studies reflects the different study designs. In the first study, only non-GERD-related NCCP patients were included, whereas all newcomers were enrolled into the second study. A recent study from Chile evaluated 100 newly diagnosed NCCP patients and found that 8% of them had an abnormal esophageal manometry.65 In this study, 36% of patients had nutcracker esophagus, 28% hypotensive lower esophageal sphincter, and 16% nonspecific esophageal motor disorder. The reason for the discrepancy between the results of this study and the other 2 is unclear. It appears, however, that the high rate of esophageal motility abnormalities recorded in NCCP patients in this study may reflect a local referral bias. Some authorities have proposed using esophageal motility abnormalities in NCCP patients as a marker for an underlying motor disorder that may be responsible for patients' symptoms.70 However, it is plausible that our current evaluative techniques of the esophagus provide only crude information about esophageal motor function. Future tests will require providing a more comprehensive evaluation of anatomical structure and biomechanics of the esophagus and their relationship to pain. Esophageal hypersensitivity has been demonstrated in most of the non-gastroesophageal reflux disease-related noncardiac chest pain patients, regardless if esophageal dysmotility is present or absent. Studies have consistently documented alteration in pain perception regardless of whether dysmotility was present or absent in patients with NCCP. 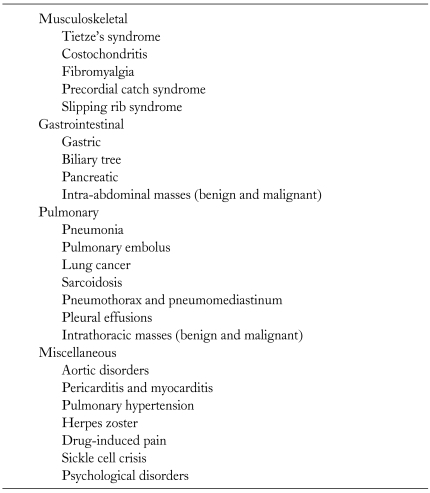 Visceral hypersensitivity is a phenomenon in which conscious perception of visceral stimulus is enhanced independently of the intensity of the stimulus.55 Peripheral and central mechanisms have been proposed to be responsible for visceral hypersensitivity in patients with NCCP. It has been hypothesized that peripheral sensitization of esophageal sensory afferents leads to subsequently heightened responses to physiologic or pathologic stimuli of the esophageal mucosa.55 Additionally, central sensitization at the brain level or the dorsal horn of the spinal cord may modulate afferent neural function and thus enhance perception of intraluminal stimuli.71 What causes peripheral or central sensitization remains to be determined. Studies have shown that acute tissue irritation results in subsequent peripheral and central sensitization, which is manifested as increased background activity of sensory neurons, lowering of nociceptive thresholds, changes in stimulus response curves and enlargement of receptive fields.72 Peripheral sensitization involves the reduction of esophageal pain threshold and increase in the transduction processes of primary afferent neurons.73 Esophageal tissue injury, inflammation, spasm or repetitive mechanical stimuli can all sensitize peripheral afferent nerves. The presence of esophageal hypersensitivity can be subsequently demonstrated long after the original stimulus is no longer present and the esophageal mucosa has healed. However, it is still unclear what factors are pivotal for the persistence of such esophageal hypersensitivity. Studies have demonstrated that patients with non-GERD-related NCCP have lower perception thresholds for pain. Richter et al74 used balloon distension protocol in the distal esophagus and found that 50% of patients with NCCP developed pain at volumes of 8 mL or less in comparison with 9 mL or more in healthy subjects who developed pain. The authors found no difference in the pressure-volume curve of the 2 groups as well as no difference in esophageal motility.74 When the balloon was inflated to 10 mL, patients with a history of NCCP were more likely to experience pain (18/30) than the control subjects (6/30).73 Barish et al73 evaluated 50 patients with NCCP and 30 healthy volunteers using graded balloon distension protocol. Of the patients with NCCP, 56% (28/50) experienced their "typical" chest pain during balloon distension as compared with 20% (6/30) of the normal controls.73 Of those with NCCP who experienced pain, 85% reported pain at values below the usual sensory threshold (20 cm H2O).75 There was no difference in esophageal tone between the 2 groups. Rao et al75 used impedance planimetry to evaluate 24 patients with NCCP and 12 healthy controls. Using balloon distention, they demonstrated that those with NCCP had lower perception thresholds for first sensation, moderate discomfort and pain in comparison to the healthy controls.75 Typical chest pain was reproduced in 83% of the NCCP patients.75 In addition, the reactivity of the esophagus to balloon distension was increased in those with NCCP, as was the pressure elastic modulus. Rao et al76 also performed graded balloon distensions of the esophagus using impedance planimetry in 16 consecutive patients with NCCP (normal esophageal evaluation) and 13 healthy control subjects. Patients who experienced chest pain during balloon distension were subsequently restudied after receiving intravenous atropine. Balloon distensions reproduced chest pain at lower sensory thresholds in most NCCP patients as compared with controls. Similar findings were documented after atropine administration despite relaxed and more deformable esophageal wall. Thus, the investigators concluded that hyperalgesia, rather than motor dysfunction, is the predominant mechanism for FCP. Mehta et al79 also demonstrated that acid infusion into the distal esophagus reduces esophageal pain thresholds for balloon distension in patients with NCCP not previously sensitive to balloon distension or acid infusion. In another small study that enrolled 22 NCCP patients with documented nutcracker esophagus, the authors demonstrated that stepwise balloon distensions reproduced pain symptoms at a lower threshold in 90% of NCCP patients as compared with 20% of healthy controls.81 It was concluded that patients with NCCP and nutcracker esophagus also exhibit visceral hypersensitivity. Additionally, visceral hypersensitivity is the likely main underlying mechanism for patients' symptoms, rather than the presence of the high amplitude contractions (nutcracker esophagus). Unfortunately, the presence of GERD in these patients was not determined in this study. In a recent study, 75% of patients with FCP who underwent impedance planimetry demonstrated esophageal hypersensitivity.82 These patients had larger cross-sectional areas, decreased esophageal wall strain, distensibility, and lower thresholds for perception, discomfort, and pain as compared with FCP patients without esophageal hypersensitivity or healthy controls. Another recent study showed that pain evoked by bag distention in FCP patients is dependent primarily on stress and to a lesser degree on strain.83 The pain does not appear to be related to mucosal perfusion. Psychological co-morbidities, such as panic disorder, anxiety and depression are common in noncardiac chest pain patients. Among all esophageal symptoms, chest pain was shown to closely correlate with psychometric abnormalities. In some patients, chest pain is part of a host of symptoms that characterize panic attack. Panic attack is a common cause for emergency room visits due to chest pain. In a large study that encompassed 441 consecutive ambulatory patients presenting with chest pain to the emergency department of a heart center, 25% were diagnosed as suffering from a panic attack.104 Whilst the reason for the observed association between NCCP and panic disorder remains to be fully elucidated, hyperventilation was demonstrated to precipitate chest pain in 15% of patients with NCCP.104 Additionally, it was demonstrated that hyperventilation could provoke reversible esophageal manometric abnormalities such as esophageal spasm (4%) and a nonspecific esophageal motor disorder (22%).105 Furthermore, studies have demonstrated that hyperventilation may precipitate a panic attack. Anxiety and depression influence reports of pain and thus contribute to the pathophysiology of NCCP. Lantinga et al106 found that patients with NCCP had higher levels of neuroticism and psychiatric comorbidity before and after cardiac catheterization than did patients with CAD. This finding appears to have prognostic significance because these patients display less improvement in pain, more frequent pain episodes, greater social maladjustment, and more anxiety at 1-year follow-up than individuals with relatively low initial levels of psychosocial disturbances. In a large epidemiological study from England, a significant relationship between NCCP and psychiatric disorders was demonstrated in young adults.107 Two independent variables were associated with chest pain: parental illness and fatigue during childhood. Cheng et al114 demonstrated that patients with NCCP, when compared to patients with rheumatism and healthy controls, tended to monitor more, use more problem-focused coping, display a coping pattern with a poorer strategy-situation fit and receive less emotional support in times of stress. Additionally, monitoring perceptual style and problem-focused coping were associated with higher levels of anxiety and depression. Jerlock et al115 evaluated 231 NCCP patients and compared their psychosocial profile with 1,069 healthy subjects without NCCP. The authors found that NCCP patients had more sleep problems, mental strain at work, stress at home, and negative life events as compared with the healthy group. Our understanding of the epidemiology and natural course of NCCP remains relatively limited. Overall, the disease appears to be very common, without any gender predilection, and be associated with a good prognosis. More has been learned over the years about GERD, esophageal dysmotility, esophageal hypersensitivity and psychological comorbidity as important underlying mechanisms of NCCP. In patients with functional chest pain, the exact pathogenesis and the initial event or events that result in life-long chronic chest pain still remain poorly understood. Jerlock M, Welin C, Rosengren A, Gaston-Johannson F. Pain characteristics in patients with unexplained chest pain and patients with ischemic heart disease. Eur J Cardiovasc Nurs. 2007;6;130-136. Fass R, Navarro-Rodriguez T. Noncardiac chest pain. J Clin Gastroenterol. 2008;42;636-646. Fenster, PE. Evaluation of chest pain: a cardiology perspective for gastroenterologists. Gastroenterol Clin North Am. 2004;33;35-40. Fenster PE, Sorrell VL. Evaluation of chest pain - a cardiology perspective for the gastroenterologist. In: Fass R, Eslick GD. Noncardiac chest pain - a growing medical problem. San Diego: Plural Publishing; 2007. p. 15-23. Ockene IS, Shay MJ, Alpert JS, Weiner BH, Dalen JE. Unexplained chest pain in patients with normal coronary arteriograms: a follow-up study of functional status. N Engl J Med. 1980;303;1249-1252. Dumville JC, MacPherson H, Griffith K, Miles JN, Lewin RJ. Non-cardiac chest pain: a retrospective cohort study of patients who attended a Rapid Access Chest Pain Clinic. Fam Pract. 2007;24;152-157. Sekhri N, Feder GS, Junghans C, Hemingway H, Timmis AD. How effective are rapid access chest pain clinics? Prognosis of incident angina and non-cardiac chest pain in 8762 consecutive patients. Heart. 2007;93;458-463. Robertson N, Javed N, Samani NJ, Khunti K. Psychological morbidity and illness appraisals of patients with cardiac and non-cardiac chest pain attending a Rapid Access Chest Pain Clinic: a longitudinal cohort study. Heart. 2008;94;e12. Galmiche JP, Clouse RE, Balint A, et al. Functional esophageal disorders. In: Drossman DA, Corazziari E, Delvaux M, Spiller RC, Talley NJ, Thompson WG. Rome III: The functional gastrointestinal disorders third edition. McLean, VA: Degnon Associates, Inc.; 2006. p. 369-418. Mudipalli RS, Remes-Troche JM, Andersen L, Rao SS. Functional chest pain - esophageal or overlapping functional disorder. J Clin Gastroenterol. 2007;41;264-269. Nevens F, Janssens J, Piessens J, Ghillebert G, De Geest H, Vantrappen G. Prospective study on prevalence of esophageal chest pain in patients referred on an elective basis to a cardiac unit for suspected myocardial ischemia. Dig Dis Sci. 1991;36;229-235. Richter, JE. Chest pain and gastroesophageal reflux disease. J Clin Gastroenterol. 2000;30;S39-S41. Ruigómez A, Massó-González EL, Johansson S, Wallander MA, García-Rodríguez LA. Chest pain without established ischaemic heart disease in primary care patients: associated comorbidities and mortality. Br J Gen Pract. 2009;59;e78-e86. Faybush EM, Fass R. Gastroesophageal reflux disease in noncardiac chest pain. Gastroenterol Clin North Am. 2004;33;41-54. Potokar JP, Nutt DJ. Chest pain: panic attack or heart attack?. Int J Clin Pract. 2000;54;110-114. Katerndahl DA, Trammell C. Prevalence and recognition of panic states in STARNET patients presenting with chest pain. J Fam Pract. 1997;45;54-63. Locke GR, Talley NJ, Fett SL, Zinsmeister AR, Melton LJ. Prevalence and clinical spectrum of gastroesophageal reflux: a population-based study in Olmstead County, Minnesota. Gastroenterology. 1997;112;1448-1456. Drossman DA, Li Z, Andruzzi E, et al. U.S. householder survey of functional gastrointestinal disorders. Prevalence, sociodemography, and health impact. Dig Dis Sci. 1993;38;1569-1580. Eslick, GD. Noncardiac chest pain: epidemiology, natural history, health care seeking, and quality of life. Gastroenterol Clin North Am. 2004;33;1-23. Eslick GD, Jones MP, Talley NJ. Non-cardiac chest pain: prevalence, risk factors, impact and consulting - a population-based study. Aliment Pharmacol Ther. 2003;17;1115-1124. Chiocca JC, Olmos JA, Salis GB, et al. Prevalence, clinical spectrum and atypical symptoms of gastro-oesophageal reflux in Argentina: a nationwide population-based study. Aliment Pharmacol Ther. 2005;22;331-342. Wong WM, Lai KC, Lam KF, et al. Prevalence, clinical spectrum and health care utilization of gastro-oesophageal reflux disease in a Chinese population: a population-based study. Aliment Pharmacol Ther. 2003;18;595-604. Kennedy JW, Killip T, Fisher LD, Alderman EL, Gillespie MJ, Mock MB. The clinical spectrum of coronary artery disease and its surgical and medical management, 1974-1979. The Coronary Artery Surgery study. Circulation. 1982;66;III16-III23. Mousavi S, Tosi J, Eskandarian R, Zahmatkesh M. Role of clinical presentation in diagnosing reflux-related non-cardiac chest pain. J Gastroenterol Hepatol. 2007;22;218-221. Tew R, Guthrie E, Creed F, Cotter L, Kisely S, Tomenson B. A long-term follow-up study of patients with ischemic heart disease versus patients with nonspecific chest pain. J Psychosom Res. 1995;39;977-985. Wong WM, Risner-Adler S, Beeler J, et al. Noncardiac chest pain: the role of the cardiologist - a national survey. J Clin Gastroenterol. 2005;39;858-862. Wong WM, Beeler J, Risner-Adler S, Habib S, Bautista J, Fass R. Attitudes and referral patterns of primary care physicians when evaluating subjects with noncardiac chest pain - a national survey. Dig Dis Sci. 2005;50;656-661. Eslick GD, Talley NJ. Non-cardiac chest pain: predictors of health care seeking, the types of health care professional consulted, work absenteeism and interruption of daily activities. Aliment Pharmacol Ther. 2004;20;909-915. Richter JE, Bradley LA, Castell DO. Esophageal chest pain: current controversies in pathogenesis, diagnosis, and therapy. Ann Intern Med. 1989;110;66-78. Eslick GD, Talley NJ. Non-cardiac chest pain: squeezing the life out of the Australian healthcare system?. Med J Aust. 2000;173;233-234. Wielgosz AT, Fletcher RH, McCants CB, McKinnis RA, Haney TL, Williams RB. Unimproved chest pain in patients with minimal or no coronary disease: a behavioral phenomenon. Am Heart J. 1984;108;67-72. Potts S, Bass CM. Psychological morbidity in patients with chest pain and normal or near-normal coronary arteries: a long-term follow-up study. Psychol Med. 1995;25;339-347. Gurevitz O, Jonas M, Boyko V, Rabinowitz B, Reicher-Reiss H. Clinical profile and long-term prognosis of women < or = 50 years of age referred for coronary angiography for evaluation of chest pain. Am J Cardiol. 2000;85;806-809. Kisely S, Guthrie E, Creed F, Tew R. Predictors of mortality and morbidity following admission with chest pain. J R Coll Physicians Lond. 1997;31;177-183. Karlson BW, Wiklund I, Bengtson A, Herlitz J. Prognosis, severity of symptoms, and aspects of well-being among patients in whom myocardial infarction was ruled out. Clin Cardiol. 1994;17;427-431. Hallani H, Eslick GD, Cox M, Wyatt JM, Lee CH. Chest pain? Cause. Lancet. 2004;363;452. Ward BW, Wu WC, Richter JE, Hackshaw BT, Castell DO. Long-term follow-up of symptomatic status of patients with noncardiac chest pain: is diagnosis of esophageal etiology helpful?. Am J Gastroenterol. 1987;82;215-218. Williams JF, Sontag SJ, Schnell T, Leya J. Non-cardiac chest pain: the long-term natural history and comparison with gastroesophageal reflux disease. Am J Gastroenterol. 2009;104;2145-2152. Wilhelmsen L, Rosengren A, Hagman M, Lappas G. "Nonspecific" chest pain associated with high long-term mortality: results from the primary prevention study in Göteborg, Sweden. Clin Cardiol. 1998;21;477-482. Eslick GD, Talley NJ. Natural history and predictors of outcome for non-cardiac chest pain: a prospective 4-year cohort study. Neurogastroenterol Motil. 2008;20;989-997. Stahl WG, Beton RR, Johnson CS, Brown CL, Waring JP. Diagnosis and treatment of patients with gastroesophageal reflux and noncardiac chest pain. South Med J. 1994;87;739-742. Fass R, Fennerty MB, Ofman JJ, et al. The clinical and economic value of a short course of omeprazole in patients with noncardiac chest pain. Gastroenterology. 1998;115;42-49. Dickman R, Emmons S, Cui H, et al. The effect of a therapeutic trial of high-dose rabeprazole on symptom response of patients with non-cardiac chest pain: a randomized, double-blind, placebo-controlled, crossover trial. Aliment Pharmacol Ther. 2005;22;547-555. Bautista J, Fullerton H, Briseno M, Cui H, Fass R. The effect of an empirical trial of high-dose lansoprazole on symptom resonse of patients with non-cardiac chest pain - a randomized, double-blind, placebo-controlled, crossover trial. Aliment Pharmacol Ther. 2004;19;1123-1130. Beedassy A, Katz PO, Gruber A, Peghini PL, Castell DO. Prior sensitization of esophageal mucosa by acid reflux predisposes to a reflux-induced chest pain. J Clin Gastroenterol. 2000;31;121-124. DeMeester TR, O&apos;Sullivan GC, Bermudez G, Midell AI, Cimochowski GE, O&apos;Drobinak J. Esophageal function in patients with angina-type chest pain and normal coronary angiograms. Ann Surg. 1982;196;488-498. Pandak WM, Arezo S, Everett S, et al. Short course of omeprazole: a better first diagnostic approach to noncardiac chest pain than endoscopy, manometry, or 24-hour esophageal pH monitoring. J Clin Gastroenterol. 2002;35;307-314. Xia HH, Lai KC, Lam SK, et al. Symptomatic response to lansoprazole predicts abnormal acid reflux in endoscopy-negative patients with non-cardiac chest pain. Aliment Pharmacol Ther. 2003;17;369-377. Singh S, Richter JE, Hewson EG, Sinclair JW, Hackshaw BT. The contribution of gastroesophageal reflux to chest pain in patients with coronary artery disease. Ann Intern Med. 1992;117;824-830. Hsia PC, Maher KA, Lewis JH, Cattau EL, Fleischer DE, Benjamin SB. Utility of upper endoscopy in the evaluation of noncardiac chest pain. Gastrointest Endosc. 1991;37;22-26. Frøbert O, Funch-Jensen P, Jacobsen NO, Kruse A, Bagger JP. Upper endoscopy in patients with angina and normal coronary angiograms. Endoscopy. 1995;27;365-370. Dickman R, Mattek N, Holub J, Peters D, Fass R. Prevalence of upper gastrointestinal tract findings in patients with noncardiac chest pain versus those with gastroesophageal reflux disease (GERD)-related symptoms: results from a national endoscopic database. Am J Gastroenterol. 2007;102;1173-1179. Smith JL, Opekun AR, Larkai E, Graham DY. Sensitivity of the esophageal mucosa to pH in gastroesophageal reflux disease. Gastroenterology. 1989;96;683-689. Hollerbach S, Bulat R, May A, et al. Abnormal cerebral processing of oesophageal stimuli in patients with noncardiac chest pain (NCCP). Neurogastroenterol Motil. 2000;12;555-565. Hu WH, Martin CJ, Talley NJ. Intraesophageal acid perfusion sensitizes the esophagus to mechanical distension: a Barostat study. Am J Gastroenterol. 2000;95;2189-2194. Sarkar S, Aziz Q, Woolf CJ, Hobson AR, Thompson DG. Contribution of central sensitisation to the development of non-cardiac chest pain. Lancet. 2000;356;1154-1159. Balaban DH, Yamamoto Y, Liu J, et al. Sustained esophageal contraction: a marker of esophageal chest pain identified by intraluminal ultrasonography. Gastroenterology. 1999;116;29-37. Pehlivanov N, Liu J, Mittal RK. Sustained esophageal contraction: a motor correlate of heartburn symptom. Am J Physiol Gastrointest Liver Physiol. 2001;281;G743-G751. Dogan I, Puckett JL, Padda BS, Mittal RK. Prevalence of increased esophageal muscle thickness in patients with esophageal symptoms. Am J Gastroenterol. 2007;102;137-145. Kushnir VM, Sayuk GS, Gyawali CP. Abnormal GERD parameters on ambulatory pH monitoring predict therapeutic success in noncardiac chest pain. Am J Gastroenterol. 2010;105;1032-1038. Katz PO, Dalton CB, Richter JE, Wu WC, Castell DO. Esophageal testing of patients with noncardiac chest pain or dysphagia. Results of three years&apos; experience with 1161 patients. Ann Intern Med. 1987;106;593-597. Dekel R, Pearson T, Wendel C, De Garmo P, Fennerty MB, Fass R. Assessment of oesophageal motor function in patients with dyspepsia or chest pain - the Clinical Outcomes Research Initiative experience. Aliment Pharmacol Ther. 2003;18;1083-1089. Lam HG, Dekker W, Kan G, Breedijk M, Smout AJ. Acute noncardiac chest pain in a coronary care unit. Evaluation by 24-hour pressure and pH recording of the esophagus. Gastroenterology. 1992;102;453-460. Fass, R. Chest pain of esophageal origin. Curr Opin Gastroenterol. 2002;18;464-470. Peters L, Maas L, Petty D, et al. Spontaneous noncardiac chest pain. Evaluation by 24-hour ambulatory esophageal motility and pH monitoring. Gastroenterology. 1988;94;878-886. Breumelhof R, Nadorp JH, Akkermans LM, Smout AJ. Analysis of 24-hour esophageal pressure and pH data in unselected patients with noncardiac chest pain. Gastroenterology. 1990;99;1257-1264. Achem SR, Kolts BE, Wears R, Burton L, Richter JE. Chest pain associated with nutcracker esophagus: a preliminary study of the role of gastroesophageal reflux. Am J Gastroenterol. 1993;88;187-192. DiMarino AJ, Allen ML, Lynn RB, Zamani S. Clinical value of esophageal motility testing. Dig Dis. 1998;16;198-204. Fass R, Naliboff B, Higa L, et al. Differential effect of long-term esophageal acid exposure on mechanosensitivity and chemosensitivity in humans. Gastroenterology. 1998;115;1363-1373. Handwerker HO, Reeh PW. Nociceptors: chemosensitivity and sensitization by chemical agents. In: Willis WD. Hyperalgesia and allodynia. New York: Raven Press; 1992. p. 107. Barish CF, Castell DO, Richter JE. Graded esophageal balloon distention. A new provocative test for noncardiac chest pain. Dig Dis Sci. 1986;31;1292-1298. Richter JE, Barish CF, Castell DO. Abnormal sensory perception in patients with esophageal chest pain. Gastroenterology. 1986;91;845-852. Rao SS, Gregersen H, Hayek B, Summers RW, Christensen J. Unexplained chest pain: the hypersensitive, hyperreactive, and poorly compliant esophagus. Ann Intern Med. 1996;124;950-958. Rao SS, Hayek B, Summers RW. Functional chest pain of esophageal origin: hyperalgesia or motor dysfunction. Am J Gastroenterol. 2001;96;2584-2589. Börjesson M, Pilhall M, Eliasson T, Norssell H, Mannheimer C, Rolny P. Esophageal visceral pain sensitivity: effects of TENS and correlation with manometric findings. Dig Dis Sci. 1998;43;1621-1628. Lembo, AJ. Visceral hypersensitivity in noncardiac chest pain. Gastroenterol Clin North Am. 2004;33;55-60. Mehta AJ, De Caestecker JS, Camm AJ, Northfield TC. Sensitization to painful distension and abnormal sensory perception in the esophagus. Gastroenterology. 1995;108;311-319. Sarkar S, Thompson DG, Woolf CJ, Hobson AR, Millane T, Aziz Q. Patients with chest pain and occult gastroesophageal reflux demonstrate visceral pain hypersensitivity which may be partially responsive to acid suppression. Am J Gastroenterol. 2004;99;1998-2006. Mujica VR, Mudipalli RS, Rao SS. Pathophysiology of chest pain in patients with nutcracker esophagus. Am J Gastroenterol. 2001;96;1371-1377. Nasr I, Attaluri A, Hashmi S, Gregersen H, Rao SS. Investigation of esophageal sensation and biomechanical properties in functional chest pain. Neurogastroenterol Motil. 2010;22;Array-526. Hoff DA, Gregersen H, Ødegaard S, Hjertaker BT, Hatlebakk JG. Sensation evoked by esophageal distension in functional chest pain patients depends on mechanical stress rather than on ischemia. Neurogastroenterol Motil. 2010;22;Array-Array. Bass C, Wade C, Hand D, Jackson G. Patients with angina with normal and near normal coronary arteries: clinical and psychosocial state 12 months after angiography. Br Med J (Clin Res Ed). 1983;287;1505-1508. Bass C, Wade C. Chest pain with normal coronary arteries: a comparative study of psychiatric and social morbidity. Psychol Med. 1984;14;51-61. Channer KS, Papouchado M, James MA, Rees JR. Anxiety and depression in patients with chest pain referred for exercise testing. Lancet. 1985;2;820-823. Costa, PT. Influence of the normal personality dimension of neuroticism on chest pain symptoms and coronary artery disease. Am J Cardiol. 1987;60;20J-26J. McCroskery JH, Schell RE, Sprafkin RP, Lantinga LJ, Warner RA, Hill N. Differentiating anginal patients with coronary artery disease from those with normal coronary arteries using psychological measures. Am J Cardiol. 1991;67;645-646. Flugelman MY, Weisstub E, Galun E, et al. Clinical, psychological and thallium stress studies in patients with chest pain and normal coronary arteries. Int J Cardiol. 1991;33;401-408. Mayou R, Bryant B, Forfar C, Clark D. Non-cardiac chest pain and benign palpitations in the cardiac clinic. Br Heart J. 1994;72;548-553. Chignon JM, Lepine JP, Ades J. Panic disorder in cardiac outpatients. Am J Psychiatry. 1993;150;780-785. Tennant C, Mihailidou A, Scott A, et al. Psychological symptom profiles in patients with chest pain. J Psychosom Res. 1994;38;365-371. Wong WM, Lam KF, Cheng C, et al. Population based study of noncardiac chest pain in southern Chinese: prevalence, psychosocial factors and health care utilization. World J Gastroenterol. 2004;10;707-712. Clouse RE, Lustman PJ. Psychiatric illness and contraction abnormalities of the esophagus. N Engl J Med. 1983;309;1337-1432. Cannon RO, Benjamin SB. Chest pain as a consequence of abnormal visceral nociception. Dig Dis Sci. 1993;38;193-196. Fleet RP, Dupuis G, Marchand A, Burelle D, Arsenault A, Beitman BD. Panic disorder in emergency department chest pain patients: prevalence, comorbidity, suicidal ideation, and physician recognition. Am J Med. 1996;101;371-380. Demiryoguran NS, Karcioglu O, Topacoglu H, et al. Anxiety disorder in patients with non-specific chest pain in the emergency setting. Emerg Med J. 2006;23;99-102. Jones M, Lewis A. Effort syndrome. Lancet. 1941;237;813-818. Huffman JC, Pollack MH. Predicting panic disorder among patients with chest pain: an analysis of the literature. Psychosomatics. 2003;44;222-236. Alexander PJ, Prabhu SG, Krishnamoorthy ES, Halkatti PC. Mental disorders in patients with noncardiac chest pain. Acta Psychiatr Scand. 1994;89;291-293. Carter CS, Maddock RJ. Chest pain in generalized anxiety disorder. Int J Psychiatry Med. 1992;22;291-298. Dammen T, Ekeberg O, Arnesen H, Friis S. Personality profiles in patients referred for chest pain. Investigation with emphasis on panic disorder patients. Psychosomatics. 2000;41;269-276. Husser D, Bollmann A, Kühne C, Molling J, Klein HU. Evaluation of noncardiac chest pain: diagnostic approach, coping strategies and quality of life. Eur J Pain. 2006;10;51-55. Stollman NH, Bierman PS, Ribeiro A, Rogers AI. CO provocation of panic: symptomatic and manometric evaluation in patients with noncardiac chest pain. Am J Gastroenterol. 1997;92;839-842. Cooke RA, Anggiansah A, Wang J, Chambers JB, Owen W. Hyperventilation and esophageal dysmotility in patients with noncardiac chest pain. Am J Gastroenterol. 1996;91;480-484. Lantinga LJ, Sprafkin RP, McCroskery JH, Baker MT, Warner RA, Hill NE. One-year psychosocial follow-up of patients with chest pain and angiographically normal coronary arteries. Am J Cardiol. 1988;62;209-213. Hotopf M, Mayou R, Wadsworth M, Wessely S. Psychosocial and development antecedents of chest pain in young adults. Psychosom Med. 1999;61;861-867. Dammen T, Arnesen H, Ekeberg O, Friis S. Psychological factors, pain attribution and medical morbidity in chest-pain patients with and without coronary artery disease. Gen Hosp Psychiatry. 2004;26;463-469. Katon W, Hall ML, Russo J, et al. Chest pain: relationship to psychiatric illness to coronary arteriographic results. Am J Med. 1988;84;1-9. Eken C, Oktay C, Bacanli A, et al. Anxiety and depressive disorders in patients presenting with chest pain to the emergency department: a comparison between cardiac and non-cardiac origin. J Emerg Med. 2010;39;144-150. Cormier LE, Katon W, Russo J, Hollifield M, Hall ML, Vitaliano PP. Chest pain with negative cardiac diagnostic studies. Relationship to psychiatric illness. J Nerv Ment Dis. 1988;176;351-358. García-Campayo J, Rosel F, Serrano P, et al. Different psychological profiles in non-cardiac chest pain and coronary artery disease: a controlled study. Rev Esp Cardiol. 2010;63;357-361. Beitman BD, Basha I, Flaker G, et al. Atypical or nonanginal chest pain. Panic disorder or coronary artery disease?. Arch Intern Med. 1987;147;1548-1552. Cheng C, Wong WM, Lai KC, et al. Psychosocial factors in patients with noncardiac chest pain. Psychosom Med. 2003;65;443-449. Jerlock M, Kjellgren KI, Gaston-Johansson F, et al. Psychosocial profile in men and women with unexplained chest pain. J Intern Med. 2008;264;265-274. Fagring AJ, Gaston-Johannson F, Kjellgren KI, Welin C. Unexplained chest pain in relation to psychosocial factors and health-related quality of life in men and women. Eur J Cardiovasc Nurs. 2007;6;329-336.